« A Monk’s Chronicle: 26 November MMXVIII — Is Christ Our King? 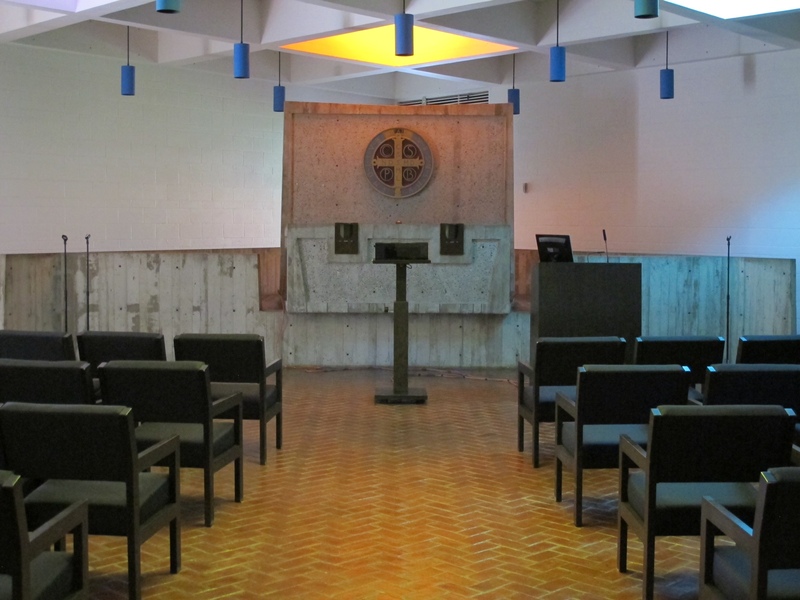 Once a month we monks at Saint John’s set aside a day for reflection. From rising until dinner we are silent — save for prayer — and the abbot convenes us for a spiritual conference in the chapter house. Given that we already live in a monastery, it’s fair to ask why in the world we’d need to do this extra stuff. Aren’t twenty-nine or thirty days a month in church enough already? Well, the answer is yes, and no. Monks follow a religious regimen that most people would consider more than adequate. But for a moment consider where we’re coming from. Just because we go to church several times a day, and just because we practice all sorts of other rituals, that doesn’t keep us from turning it all into a numbing round of activity. And therein is the value of an occasional day off to get a grip on ourselves. Whether we do a lot or a little or nothing, slippping into an unexamined routine can rob life of its intensity. That’s why we — and anybody — should do this sort of thing. From a seasonal point of view Saturday’s conference had real possibilities. Advent was to begin the next day, and in the gospel text for the First Sunday of Advent Jesus urges people to “be awake.” It’s just the sort of advice we need to hear once in a while, and it was the theme that Abbot John chose to focus on, in hopes of stirring us on a sleepy Saturday morning. However, I began to wonder if he was about to fritter the opportunity away with his opening comment. He reminded us that Saint Benedict says nothing about Advent in his Rule for Monasteries. On the other hand Benedict does say that the lives of monks ought to be like a Lenten observance. But as for Advent, Benedict says nothing. Nada. Zip. It’s like the season doesn’t even exist, which naturally made me wonder. Was it because in 6th-century Italy they didn’t have Black Friday or the pre-Christmas shopping season? Or was it because there were as yet no shopping malls to give meaning to the season of Advent? We’ll likely never know. But having mulled over Saint Benedict’s telling omission, I began to wonder why the abbot had roused us out of our reverie on a Saturday morning. Did he do it just so he could tell us that Advent was unmonastic? Abbot John did not choose to go in that direction. But his opening bit did succeed in priming the pump for my own sometimes irreverent thoughts. And so, once again, last Saturday morning I reaffirmed the value of an Advent observance, even in a Benedictine monastery, and even for me. In the gospel for the First Sunday of Advent Jesus makes this point: “Beware that your hearts do not become drowsy from carousing and drunkenness and the anxieties of daily life, and that day catch you like a trap.” (Luke 21: 34). Drowsiness is the problem, and the day to which Jesus refers is the day of the coming of the Lord. And if we let the complexities of daily life overwhelm us then there may be unintended consequences. The Lord will come, but we’ll be the last to know that he had been standing right in front of our noses and we hadn’t even noticed. Maybe that’s why Saint Benedict doesn’t bother to write anything about the season of Advent. Maybe it’s because he presumes that monks — and all Christians for that matter — should be aware that Advent goes on around us all the time. Granted, the gospel speaks of the day when we will stand before the Lord at the end of time; but all the same the Lord isn’t exactly hiding from us right now. In fact, Jesus is in front of us, in plain sight, each and every day. For that reason Benedict writes that the monk should see Christ in the guest, in the elderly and sick, in the abbot and in the youngest monks. And the same applies to everyone else. Whether it’s in the poor and sick, in the lonely or struggling, or in the person who needs our kind word or smile, the Lord makes cameo appearances all the time. So it is that the Lord’s advent is present to us every day; and if once a year we need a season to serve as a reminder to us, then so be it. That explains the urgency in the words of Jesus. He’s coming, but not just at the end of time. Advent is the season when we deliberately rouse ourselves from our routine and admit how incredibly blessed we are. We have the chance to meet the Lord — today. Why wouldn’t we want to stay awake for that? +On November 27th I presided and preached at the Eucharist for members of the San Francisco area Order of Malta, who had gathered for their annual meeting. +On December 1st we had our monthly day of reflection, and we assembled for a conference written by Abbot John. Because that morning the abbot was away to preside at the funeral of his aunt, Brother David-Paul was delegated to read the abbot’s conference to the community. +On December 1st the football team of Saint John’s University ended its season with a loss in the NCAA Division III playoffs. The game took place in Belton, TX, which is a small town in central Texas. Oddly enough, I’ve been there a few times. My grandparents lived near there, and my father was born in nearby Westphalia, TX. +A few days ago the nation and Saint John’s lost a wonderful scholar and friend. Dr. James Billington served as the Librarian of Congresss for ages, and he was generous in his energy and expertise in arranging an exhibit of The Saint John’s Bible at the Library of Congress. He also spoke at an event at Saint John’s, and our last encounter took place when he gathered in the office of John Boehner, the Speaker of the House, on the occasion of the visit of Pope Francis. In the presence of Pope Francis, the Speaker, Abbot John and a few others, Dr. Billington accepted a set of the Apostles Edition of The Saint John’s Bible, to mark the occasion of the Pope’s visit. That set now resides in the Library of Congress. 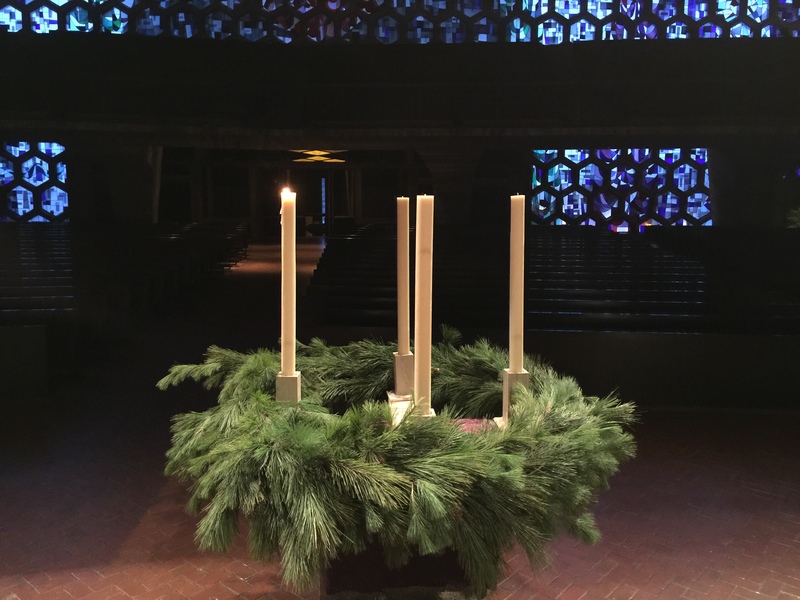 +At the top of this post is a photo of the Advent wreath in the abbey church. We also have a second large wreath in the refectory. 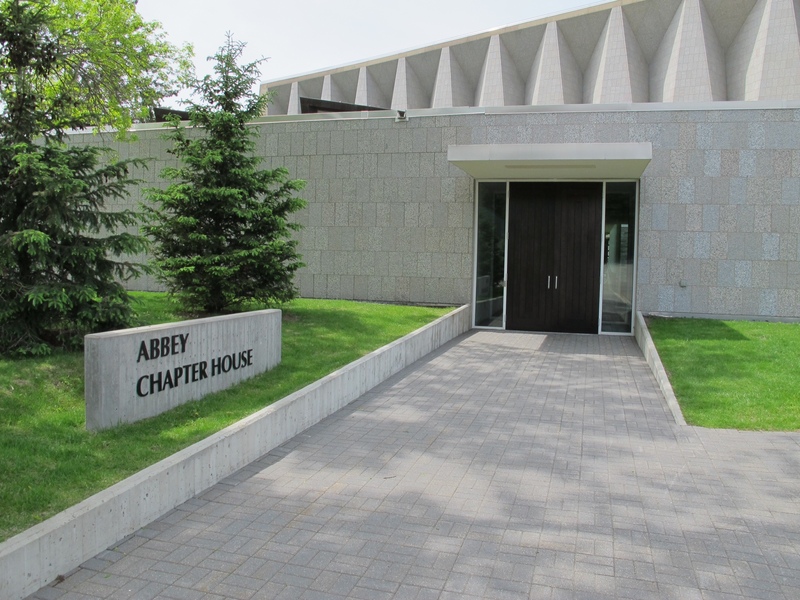 Below that are two photos of the abbey chapter house, where we gather for spiritual conferences and meetings. 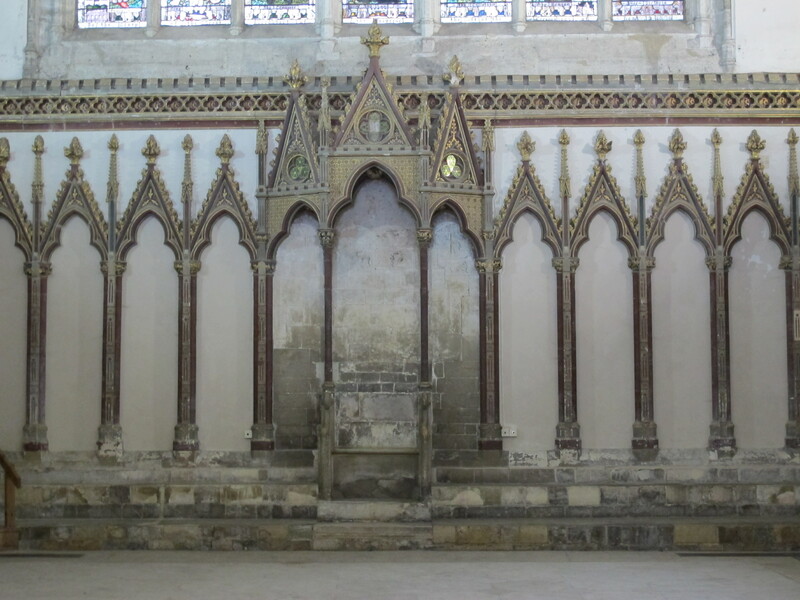 While it may seem a substantial building, it’s dwarfed by many of its medieval counterparts, as illustrated by the two photos of the chapter house at Canterbury Cathedral. 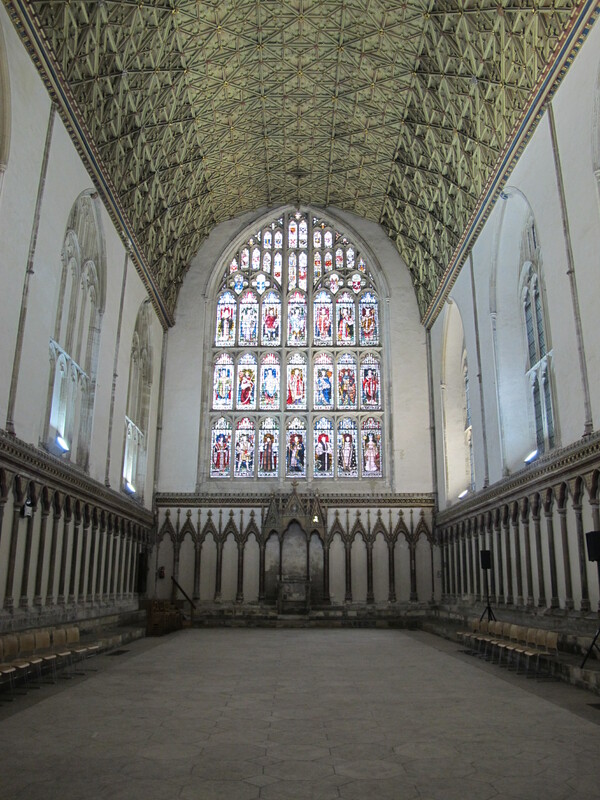 As you might imagine, I prefer our cushioned seats to the stone benches at Canterbury.